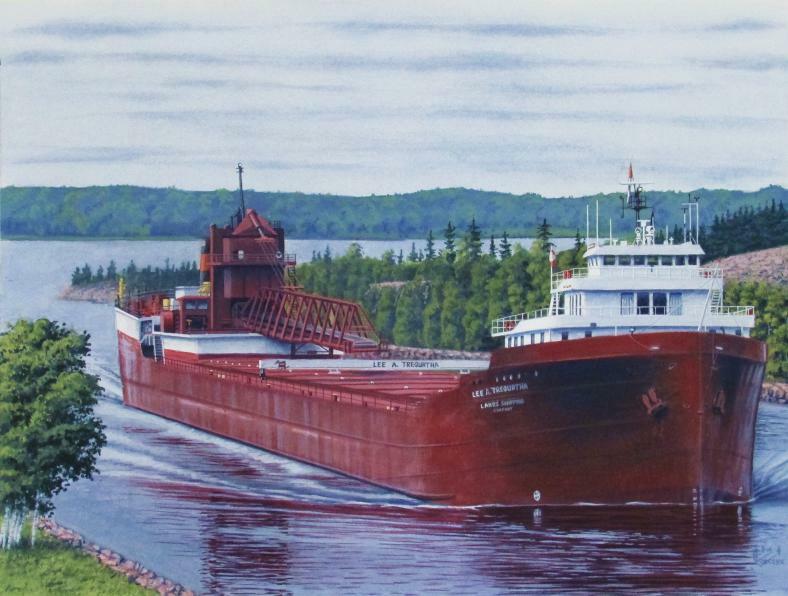 it was deemed necessary to construct a one way, downbound channel to the west side of Neebish Island in the St. Marys River. Located 15 miles south of the Soo Locks and very near Barbeau, MI, the blasting of a channel was completed in 1909 and became known as the Rock Cut. With a length of 13,300 feet, the channel is 28.5 feet deep and only 300 feet wide, making it the narrowest spot on the St. Marys besides the Locks themselves. Not only is the confined passageway a concern but also the water levels can change dramatically. When loading at a Lake Superior port, captains call ahead to find out what the water level in the Rock Cut is then load accordingly. Even so, when the ship arrives at the Rock Cut, strong winds on the River will drop the water level and pile the water up elsewhere. Ships are then forced to drop anchor and wait for the winds to subside and the water level to return.